Tropical Storm Michael has been upgraded to a hurricane as it churns in the Gulf and is forecast to become a major Category 3 storm when it makes landfall in the Florida Panhandle later this week. Florida Gov. Rick Scott has now declared a state of emergency in 35 counties ahead of its predicted landfall on Wednesday. The Federal Emergency Management Agency has mobilized resources from the federal government to assist with the preparation. The National Hurricane Center announced the upgrade from a tropical storm at 11 a.m. Monday. Tropical Storm Michael is moving north on Monday as it targets Florida later this week. 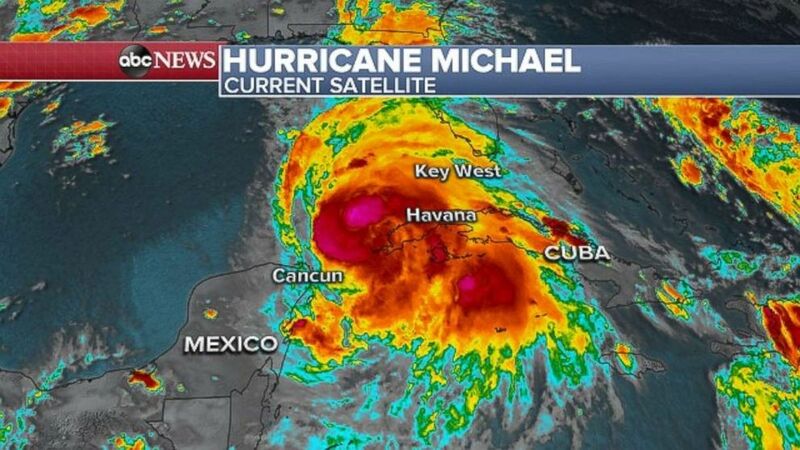 Michael had maximum sustained winds of 70 mph as of 11 a.m. on Monday. It is currently located 50 miles west of Cuba and 140 miles east of Cozumel, Mexico. A hurricane watch has been issued for north Florida and a tropical storm watch has been issued for parts of the western coast of Florida, including Tampa. A tropical storm watch has also been issued for the Alabama coast, including Mobile. 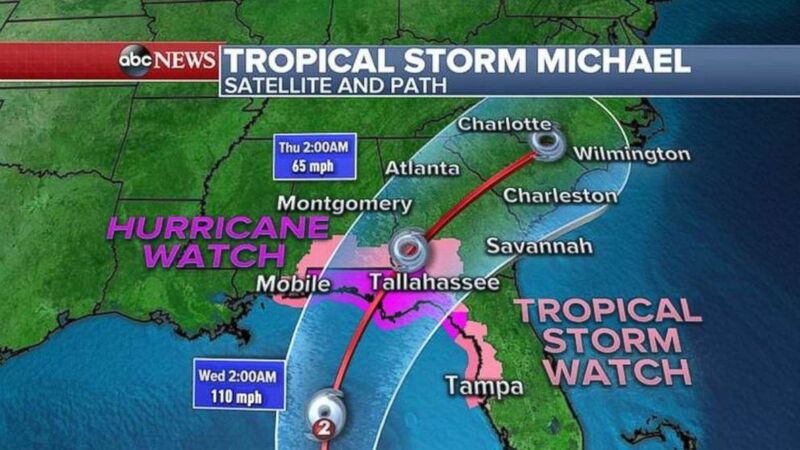 A hurricane warning and tropical storm watch are in place ahead of Michael’s arrival. The storm will move further inland later in the week and bring rain and wind to Georgia, South Carolina, North Carolina and Virginia. The Carolinas and Virginia were blasted by Hurricane Florence last month, which dumped more than 2 feet of rain in some locations and caused record flooding. The Coast Guard is now urging boat owners to prepare ahead of the storm by either moving their boats out of the water or to an inland marina. “Early preparations are key to keeping you, your boat and maritime responders safe,” said Capt. Holly Najarian, the commander for Coast Guard sector St. Petersburg. Oil giant BP announced Monday that it was closing four of its operated platforms in the Gulf of Mexico. “With forecasts indicating that the storm will strengthen as it moves into the northern Gulf of Mexico, BP is in the process of evacuating personnel,” the company said in a statement. 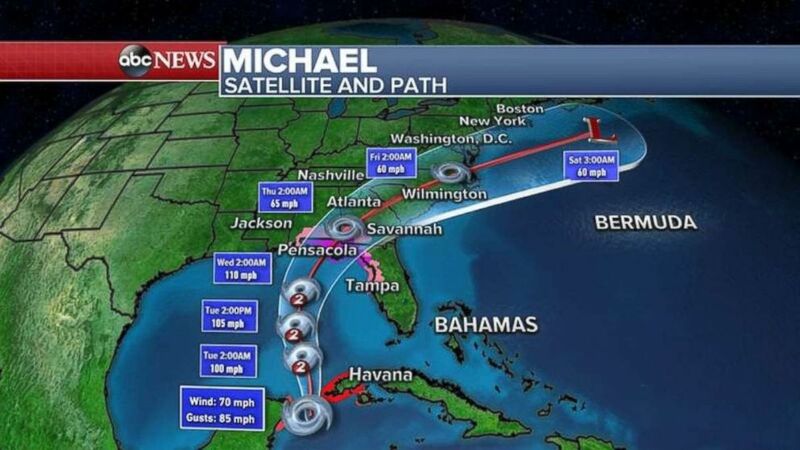 Michael is expected to make landfall on Wednesday and move through the Southeast at the end of the week. Florida State University is taking early steps as well, closing its campuses in Tallahassee and Panama City. Campus housing and dining facilities will still be open for those students who are not evacuating. “Students are encouraged to discuss possible travel plans with family and friends,” the school warned in a news release.